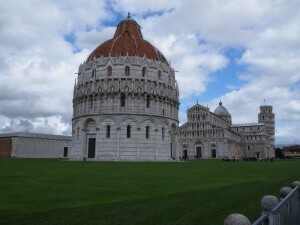 From Rome to Pisa to Florence and Back to Rome Again! 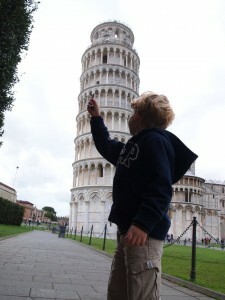 As the father of a 5-year-old boy who just HAD to go and see the Leaning Tower of Pisa while were were in Rome, I thought I should write down some notes for any one else who might attempt a similar trip. Searching the web provided lots of insights, but some information was missing, wrong, or incomplete. There are a quite a few options. Your search should start at the Tren Italia website which has an English version available (link: www.trenitalia.com/. There you will find that you can take trains from Roma Termini to Pisa Centrale via Firenze (Florence). There are some fast ones available between Firenze and Roma (named “FECCIA”-something). Do be aware that these are quite comfortable/nice, quiet, and obviously quick; however, they cause more motion sickness then the slower trains and they also cause many more pressure changes (you will feel it in your ears) when you go through the many tunnels along the way. Additonally you will still have to change in Firenze SMN to another train. Another very acceptable option is go to the Roma San Pietro station near the Vatican (bus 64 takes you there as of April 2012). From this small station there are many options for regional trains. Some are direct with no transfers and some transfer in Civitavecchia to Pisa. Either way, these can be desirable because they tracks run along the western coast, showing you sites you might not otherwise see. Please note that total travel time may be about the same as it would be through Firenze and it will cost you less. Therefore, all things considered, this might the best option. As of April 2012, you can take the LAM ROSSA bus from the station to the tower. Cross the street in front of the station and the bus will pick you up there at the bus stop. Look for other clueless tourists to reassure yourself you are in the correct location. You will need a bus ticket which you can buy at the “newstand” in the terminal. The ride takes a while, but keep looking left or you might miss your stop. A good indicator is that many people will get off there. This was a “Regionale” train, it took only about 1 hour and seemed virtually non-stop. The ticket was cheap enough that we thought we ought to take it and stop by and see Florence for the afternoon. Exiting the station to the right (west) will take you too the trams (street cars) and exiting to the left or south will get you headed in the direction of the Montefiascone Cathedral (after a 10 – 15 minute walk). It was a pleasant stop. We took the “FECCIA” train heading back so that we could be “home” before midnight. It was a quick trip, but not comfortable enough to sleep for us (see notes below). The train did get us back quickly, but of course left us at Roma Termini. The bus ride “home” was exciting due to the driver’s lead-footed dangerous flight through Roma’s busy nightlife. When we arrived at our wonderful bed & breakfast apartment near the Vatican we literally felt as though we had come home. It was a busy day and the comfortable apartment was so welcoming after all of our sites and travels. Some trains are just faster than others and some trains just stop more frequently than others. This is really true throughout the world. For this trip I think the slowest train is called “Regionale”. A step above this is “Regionale Veloc”. Then I think the next one up is “Intercity”, followed by the bullet trains called “FECCIA-something”. The “FECCIA” trains will have the cleanest coaches and bathrooms, but I found the coaches on the “Regionale” trains passable. We also felt motionsickness and too many pressure changes in the “FECCIA”; the “Regionale” trains were much easier to sleep on as a result. In the spring of 2012 in order to climb up the tower you needed to be at least 8 years old. This was a big surprise to us and to many others who wanted to climb with their kids. You won’t be told this until you find the ticket booth in the back and you are told the bad news by the folks selling the expensive tickets. We were so lucky to have found Rosa Maria’s “Al Colonnato di San Pietro“. We stayed in her “Moon” apartment and loved it. The location was wonderful, right next to the Vatican and right on a bus line. TripAdvisor brought it to our attention, but the reviews and email exchanges with Miss Rosa Maria sold us. In person she was even better. She looked out for us as if we were her family. It was she that pointed us to use the Roma San Pietro station to get to Pisa. She knows so much about the city and outlaying areas. She even went the extra mile helping us to load up on San Marzano tomatoes and seeds. We would stay with her again in a heart beat. If you have any questions about her B & B or apartments please contact me. « Who Was Your Hero?